Notes: I got this book at the library, after waiting for its release for about six months. G. Willow Wilson's memoir is as complex as people's identities; this is not merely a love story, or a conversion memoir, or the tales of an American expat, or the experiences of a woman in a male-dominated culture. I was drawn to this book because, having lived in Egypt myself (though under the umbrella of a 'structured' study abroad program at the American University in Cairo), I was curious to hear this woman's story. How did her experiences change her life so intimately and drastically? This is direct commentary on Wilson's personal experiences, but I found it wonderful that she converted to Islam or embraced its role in her life prior to her engagement and subsequent marriage to Omar. People often assume that individuals convert to Islam because they are persuaded or forced to do so. Though Islam is a proselytizing religion, it maintains many of the same tenets as monotheistic religions like Judaism and Christianity, and for that reason has broad-based appeal. Wilson and her friends are not left unscathed by the post-9/11 political environment. Though it is not central to this memoir, some of Wilson's colleagues and friends are investigated by federal agents; her phone is tapped at times. These are the realities of contemporary American security concerns, and I commend Wilson for her treatment and discussion of them in this book. Wilson's writing is a pleasure to read. I found it to be purposely detailed and emotional while also succinct. She does not waste any time skirting around issues, but boldly plucks them. Her stories of not eating anything except cheese and bread reminded me of my own time in Egypt—taxicab drivers, the incredible disparity from neighborhood to neighborhood, the strange lack of sweating. She, like me, agrees that to be a Middle East expert you must live amongst human beings in the Middle East. What may draw many readers in is the love story. Wilson's storybook romance is full of uncertainty, cultural barriers, and the mystery of romance in any society. Yet despite their differences, Wilson and Omar find many more similarities. Readers will find their love fascinating and beautiful. I highly recommend this book to anyone who is curious about Islam or American Muslim converts. You do not need to be learned in either subject to read this book, though it may help. I found the use of Arabic and either Muslim or Arabic quotes throughout the text to be wonderful. I think that this book is a good counterpoint to Irshad Manji and Ayaan Hirsi Ali, who depict a negative image of Islam that is quite unrealistic, yet garners great attention from American media. Jess--You always read the most interesting books!! This sounds so fascinating! Great review. Definitely a book I would have never read of! I love the review, but I just have one problem with it. Why are Wilson's life experiences more legitimate than Ayaan Hirsi Ali's? Both of them are recounting real events in their lives. Ayaan just lived through all of the bad things about Islam (FGM, rampant oppression of women, death threats, arranged marriage, etc) while Wilson lived in a different time and place, and had mostly good experiences. To say that one is more legitimate than the other is to say that there is only one side to Islam, and only one experience to be had in Islamic countries, when in fact there are as many kinds of Islam as there are kinds of Christianity, and the experiences range from the type found in Afghanistan to the type found here in America. Reading just one of the books would certainly give a biased view, but I would think that reading books from all different perspectives would be the most accurate and honest way to learn. But other than my issues with the last sentence, I'd say it's a great review. It almost makes me want to go pick up the book. I think this sounds like a lovely book, it is going on my wish list. I think it is interesting that you say it is a good counterpoint to the more negative books but I think both are necessary, as with any issue, to fully understand. Thanks for the comments! I'm glad that my review sparked some interest. Emily, I never wrote that AHA's experiences weren't legitimate. I just think that their experiences are overrepresented. I agree that reading books from all different perspectives would certainly give a biased review. I don't think my last sentence was particularly biased; I just made it clear that it would make a good counterpoint. Which is what I wrote. I think you should read the book and get back to me with what you think. 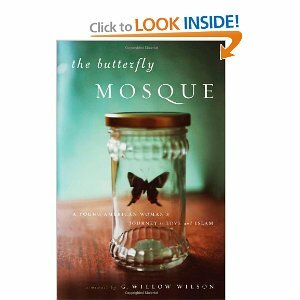 I LOVED Butterfly Mosque. I've read all of her graphic novels, and I've met her so many times she's joked about hiring me to be her personal cheerleader, but I barely knew a fraction of her real life story. I was so excited when I heard she was writing a memoir, and it did not disappoint. I was pleased how humble it was for a memoir-- half the time she was saying "I don't know the answer to the questions I know you're asking, but here's what I do know." Glad to know more people are reading it! Thanks Heather! I've thought about subbing before, but I get really nervous thinking about it, especially in hs. I agree with Jamie, you always find really interesting books to read, Jess! This is definitely going to be on my tbr list for my Middle Eastern Reading Challenge. It sounds fascinating. Thanks for a great reivew!